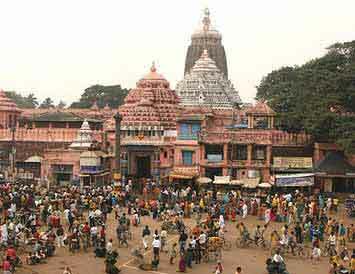 The holy city of Puri, 60 km from Bhubaneswar, is one of the four holiest points of pilgrimage for Hindus. The reigning deity of the city, Lord Jagannath, whose temple was built way back in the 12th century, is not only of great religious significance to the people of Orissa but is revered by thousands of pilgrims who seek His blessings from every part of the country. This intense veneration of Jagannath, or the Lord of the Universe, reaches its zenith during the annual rites of the Rath Yatra in the months of June July, when the images of Lord Jagannath, His sister Subhadra and brother Balbhadra are transported through the Grand Road (Bada Danda) of Puri in traditionally decorated massive chariots that are dragged by thousands of devotees to the Gundicha Ghar where they sojourn for a week. The process is repeated when they are returned amidst intense religious fervor to the temple. 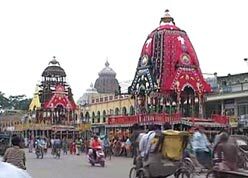 Though the temple is closed to non-Hindus, the activities of the Jagannath Temple are so immense that they create enough colour and interest for tourists to participate in the bazar element of the proceedings outside the temple precincts. The other important feature of the town is its beautiful beach which, for centuries, has offered pleasure to both pilgrims and swimmers. This picturesque beach is one of the most delightful white beaches in the country and is becoming a pleasure haunt for tourists from all over the globe. Though the surf here is pretty exciting, the under-current can be a bit tricky, so tread carefully... The areas both within and outside Puri offer excellent shopping and the nearby artist villages of Pipli (for the famous appliqué work), Raghurajpur (for pata and palm-leaf paintings) and Balakati (for bell-metal work) bring shoppers directly in contact with the craftsmen at work. It can be quite an experience. The artists village of Raghurajpur, 16 km from Puri, is famous for its patachitras created by traditional chitrakaras, who have, for centuries, also churned out palm-leaf etchings with exquisite detail. Quite a few of the craftsmen are winners of national awards. Satapara, a retreat in nature on Chilika Lake, is opened up to the tourists. For its location near the confluence of the lake with the ocean and proximity to Puri (48 km), it is an ideal spot to enjoy Chilika. The thrilling sight of dolphins round the year and abundance of migratory and resident birds in winter make it a preferred place for a vacation with nature. Choudwar, a growing industrial area was once the capital of Somakuli Keshari Kings of Orissa. Eight prominent Siva pithas were established by the Keshari dynasty in the vicinity of Choudwar which is now in ruins. Tradition records that it was the capital of Virat, the brother-in-law of Kichaka. The five Pandava brothers with their consort Draupadi took shelter in Choudwar in their secret exile. 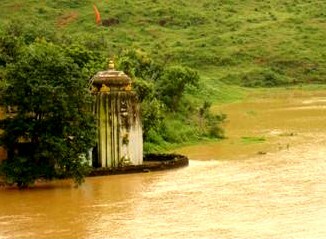 Popularly known as Chhatiabata, Chhatia is a sacred place of pilgrimage. 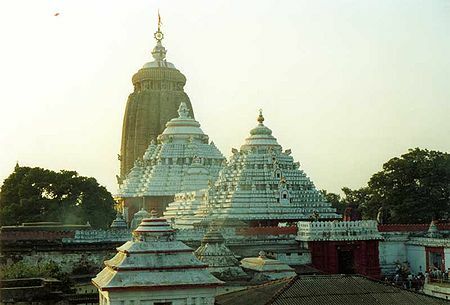 The shrine of Lord Jagannath at Chhatia is a modern piece of Orissan temple architecture. Nearby one can find the archaeological remains of Amravati-Kataka, one of the five important forts of Chodaganga Deva. Amaravati with the back drop of the hill "Dhania" presents an attractive sight. Otherwise known as Vaitarani Tirtha, Jajpur with Goddess Viraja (Durga) as its presiding deity is one of the sacred places of pilgrimage in Orissa. The place has its unique importance in India as Navigaya Kshetra where pinda is offered for the satisfaction of the ancestors. The shrine of Sweta Varaha (the white boar incarnation of Vishnu) along with hundreds of other shrines here made Jajpur a Tirtha par excellence. The "Dasavamedha Ghat", the flight of steps leading to the Vaitarani where the ten horse sacrifices were performed is a great sanctified spot for the Hindus. Ansupa the small but picturesque lake holds a prominent position in the tourist map of Orissa and offers an asylum to the migratory birds in winter. The play of the shadow of Saranda mountain and surrounding bamboo and mango groves on the rippling waters of Ansupa make it a real thing of beauty. One can have a boat journey or go for fishing in the lake. Ansupa is 70 kms from Cuttack and 20 kms from Raja-athagarh station, connected with regular bus service. These three hills comprise a remarkable buddhist complex. Hieun-T'sang, the Chinese pilgrim found it to be the seat of a flourishing Buddhist University called "Puspagiri". Extensive ruins of brick pagodas, sculptured stone portals and esoteric Buddhist images testifying its ancient glory have been unearthed. Ratnagiri is the gem of this complex. The magnificently carved door jambs of the Vihar and superbly finished Buddha images from perhaps the greatest concentration of Buddhist sculpture of the post-Gupta period. Ratnagiri is 70 kms, Lalitgiri is 55 kms and Udayagiri is 60 kms from Cuttack. 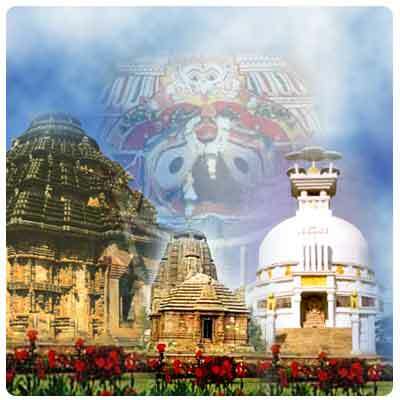 A small island in the Mahanadi, the temple of Dhavaleswar is situated on a hillock. Though a new structure, sculptures of 10 / 11th century A.D. are found in the temple premises. It is the earliest Ganga monument of Orissa, but it must be noted that the ganga temples of much earlier dates are still to traced in the Andra regions, the original seat of power of Gangas. There is adefinite mention in all the later copper plate records of the successor of Chodaganga that he was the bulider of this great temple at Puri. 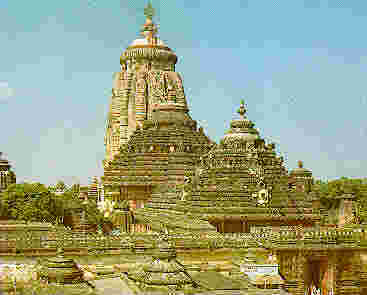 According to some evidence sources that Chodaganga had began this huge structure and one his successor Ananagabhimadev III completed it or added the Jagamohan to it. The height of the Jagannath temple of Puri as calculated as 215 feet 8 inches. 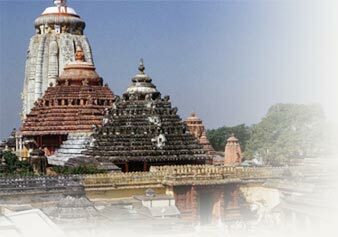 It is therefore the loftiest religious edifice of Orissa. At present the thick coat of plaster which had covered the structure for centuries has been removed. As is usual in all great temples of the period, the monument stands on a high platform which is connected with the ground level by a height of 22 very very big steps. The edifies is masive and strong and is a product of accummulated experience of the past in temple architecture and this factor has enabled it to with stand the ravages of time.